In a landscape that is becoming more competitive by the day, Dan Dixon and the crew from Mister Chop Shop have done it again with a new top quality annex in Sydney’s leafy hip suburb of Surry Hills. 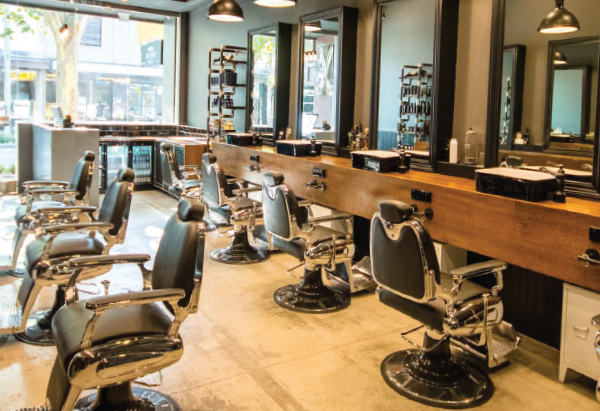 The black and timber finishes blended with a distinct industrial coolness, complement their unique mix of high end barbering and male hairdressing. Walking into this space its clear that the boys are on their game, and interestingly the wait room, which is actually quite a comfy whisky lounge, is located on the mezzanine level at the back of the shop. But wait there’s more. No, not steak knives. Seamlessly positioned in the front of this man zone is a unique coffee kiosk window, operated by friend and pals, Bellagio Cafe in conjunction with Pablo&Rusty coffee merchants. This shop really sends a message. Quality quality quality. Coffee and Cuts and a cheeky Scotch.